Police in Prince George's County, Maryland, have released photo and video surveillance of a man they say has robbed five businesses in the past 10 days. The string of robberies began on March 17, when the suspect robbed a pizza store in Oxon Hill. 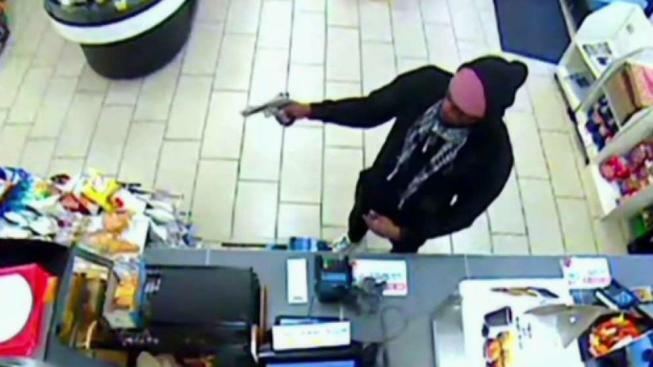 During that robbery, he pulled out a gun and demanded cash. After that, cameras captured the same man robbing a convenience store on Branch Avenue in Temple Hills on March 23. Witnesses said they saw the man change outfits after the robbery. Police said the man is also connected to robbing a separate pizza store on Temple Hill Road in Prince George's County on March 24. Then, the spree picked up, police said. The suspect allegedly robbed a convenience store on the 6000 block of Marlboro Pike in District Heights on Tuesday. And on Wednesday, the suspect robbed a pawn shop on the 5000 block of Martin Luther King Jr. Highway in Seat Pleasant. At the final robbery, the suspect was again photographed, this time wearing a distinctive orange hat and black and white scarf. Surveillance video released by Prince George’s County detectives Friday shows the suspect on the days of the Temple Hills and Seat Pleasant robberies. Prince George’s County Police encourage anyone with tips on identifying the suspect to reach out by calling 301-772-4905 or 1-866-411-TIPS. They are offering a cash reward for information.